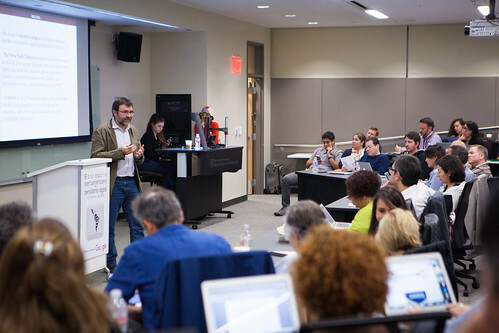 The 17th International Symposium on Online Journalism (ISOJ), a conference about online journalism organized by the Knight Center for Journalism in the Americas in the city of Austin, Texas from April 15 to 16, advocated for the discovery of issues currently of concern to digital media around the world. Ismael Nafría summarizes the lessons learned during the 17th ISOJ. Photo Mary Kang/Centro Knight. Speakers and attendees from 41 countries discussed, in-depth, issues such as the distribution of news on social platforms, the boom of messaging applications and their use by media, journalism and virtual reality, the use of bots, the role of advertising in business models and journalism sustained by nonprofit organizations, among many other topics. 2. The New York Times committed to journalism, to quality, to digital subscriptions, to becoming part of the daily routine for its users, to being a destination, to placing the user in the center of everything, to visual journalism. But, we are not all The New York Times. In any case, there are many lessons that media outlets can take from this case, what was explained in the opening session of ISOJ by Kinsey Wilson, editor for innovation and strategy and executive vice president for product and technology at The Times. It is the most used device – for many media outlets, it accounts for more than 50 percent of visits – but, the reality is that the content produced by digital media still are not fully adapted for smartphones. Facebook (with its recent developments, Instant Articles or Facebook Live), Google (AMP), Snapchat, Apple News and others are platforms that are decisively betting on the distribution of media content in their own environments. What is the best strategy for media to follow? There is no unanimity in the answer, but all agree on the importance that they can have for the future of information. In any case, adapting to each platform and having in-house, specialized teams are key elements to success. 5. Advertising is the main source of income…but important questions were raised with phenomena such as adblockers, the visibility and effectiveness of ads, etc. Media such as The Washington Post continue to strongly believe in this, even if with diversified models. Others bet on alternative formulas, such as Brazilian newspaper Zero Hora and its tablet subscriptions. The successful experiences of actors like the Center for Investigative Reporting, the Center for Public Integrity, The Marshall Project, The Texas Tribune and ProPublica show that nonprofit journalism in an alternative. Not a definitive solution, but a solid alternative to more tradition formulas for media business models. Kara Swisher speaks during ISOJ 2016. Photo: Mary Kang/Centro Knight. We are entering a new – and fascinating – territory of exploration on the part of media, which should be thinking about how to navigate the space, if they have not already done so. The experience explained in detail by Quartz is a very useful reference to examine. Video, the way visual content is most often created, is increasingly playing a role in content offered by the media. The New York Times believes, for example, that visual elements will be integrated into half of its digital production. The big names of the internet, like Facebook, are also in agreement and the users seem to join it with enthusiasm. It is imperative that media dare to experiment and innovate if they want to quickly learn to make the right decisions You need to create the right environments in the media so that experimenting and innovating is really possible. Virtual Reality (VR) opens new and extraordinary narrative possibilities for the media. It would be crazy not to explore them as soon as possible. The experience of Cuban journalist Yoani Sánchez and her project 14ymedio, as well as other projects from various countries presented during the meeting in Austin, allows us to see that the internet continues to offer huge opportunities to create information in environments where previously it was more difficult. Scalability is not always a good solution, because it is associated with costs that local media cannot take on. Today it is impossible to think of solid digital projects in which technology and the journalistic project do not go hand-in-hand and work together. To tell relevant and interesting stories for our audience, to be differential, to have personality, to adapt to the environment in the best way possible, to find the reader wherever he or she is….What the media have tried to do during their entire lifetime continues to be applicable in the digital environment. *Journalist and consultant specializing in digital media. Follow him at @ismaelnafria.